Nintendo’s Switch is a lovely system, but from a pure power standpoint it’s no PlayStation 4. Even so, a Digital Foundry report reveals the two consoles’ versions of Lego City Undercover aren’t too far apart performance-wise. While Lego City Undercover might not be the most demanding game, it is one of the first instances of a major game launching on the Nvidia Tegra X1-powered Switch and its more robust console cousins at the same time. The Switch basically has the same system-on-a chip as the Nvidia Shield console. I’ve played ports of previous generations games on the Shield—Resident Evil 6, Metal Gear Rising: Revengance—that were poor shadows of their Xbox 360 and Ps3 counterparts, so I’ve been keen to find out how the Switch handles a similar situation. As it turns out, the Switch does a fair job of keeping up with the PlayStation 4. In console mode running at 1080p, the Switch manages to match the PS4's 30 frames-per-second outdoor framerate, as well as the odd uptick to 60 FPS within interior environments. Graphically the two versions are pretty close, though some sacrifices had to be made to keep the Switch running smoothly. There’s no ambient occlusion in the Switch version, lending to a slightly flatter look. Details can get a little fuzzy thanks to low resolution textures being in play. 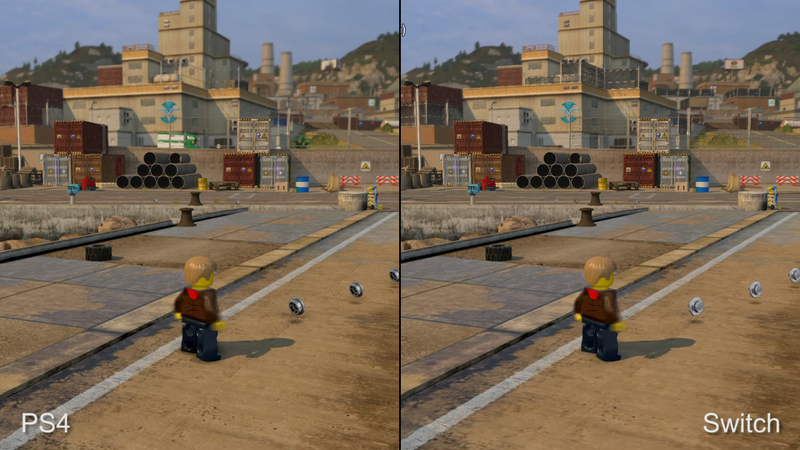 Shadows and reflections are also lower quality, resulting in more jagginess around the edges. Outside of its dock the Switch does the best it can at reduced power and resolution, but Digital Foundry noticed some noticeable frame drops in more open areas that don’t pop up when the console is docked. So there are some difference, a couple some might consider major, but the closeness of the PlayStation 4 and Switch versions of Lego City Undercover demonstrate how close Nintendo’s console can get to current generation with just a few tweaks to settings and game assets. Hit up Eurogamer to read Digital Foundry’s full report, including a look at performance over the original Nintendo Wii U release of the game as well as how the Xbox One version fares.